Entire contents copyright © 2015 Fearless Designs, Inc. All rights reserved. 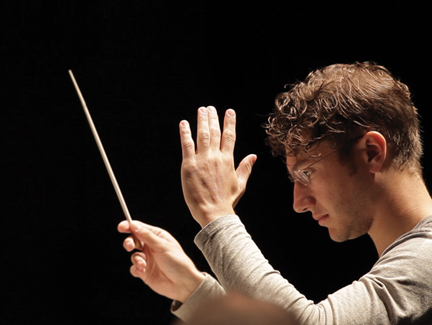 Music Director Teddy Abrams is well aware of the profound impact the Louisville Orchestra has made on the industry over the past three-quarters of a century, and he is determined to show everybody that the organization’s best days are not behind it. Preparing for his second season at the helm, Teddy has conceived an innovative, exciting season that re-examines the role of a modern orchestra both on and off the stage. Scott Dowd: I was anxious to discuss with you the extra program you have scheduled for spring 2016. SD: What made you choose Petrouchka for this co-presentation? TA: Stravinsky wrote three ballets early on in his career that catapulted him to fame, all in the very big Russian and French school of large-form, dramatic ballets with major-scale production values. These ballets call for huge orchestras, bigger than most of the orchestras you would see on stage. Of the three—The Firebird, Petrouchka and The Rite of Spring—Petrouchka was my favorite and it made sense to do that one. We’re also going to play a piece by Philip Glass and a work of mine before the intermission. I’m writing a new ballet that will be choreographed for this event. SD: How long will it be once it’s finished? TA: About fifteen minutes. It’s actually like a little symphony in terms of its style—a symphony of American allusions. Adam Hougland, Louisville Ballet’s featured choreographer, will choreograph it. SD: This should be exciting for everybody involved—on the stage or in the audience. TA: I think so. It shows that if we work together and think about what our shared goals are and think about the art first, we can do projects on a tremendous scale—an international scale. That makes a big difference to the community when you see that there are organizations putting their heads together to define our common artistic goals. With the amount of art going on in a town the size of Louisville, we can’t afford to be in our silos. It doesn’t help the artistic community as a whole when the major arts organizations are not being creative together. This is a major push and a great symbol for the creativity that is happening now. SD: The piece on that program by Philip Glass, Violin Concerto with saxophonist Amy Dickinson, is one of my favorites. TA: Amy is an extraordinary saxophone player and has done this arrangement for the instrument that Philip Glass has actually authorized. There aren’t a lot of saxophone players who can pull it off, but Amy is able to “circular breathe.” Glass’s signature is that driving, perpetual motion, and Amy is able to achieve that through this advanced technique. A violinist doesn’t need to stop the bow, but a sax player would typically need to draw a breath. Like a string player, she is able to be continuous, never stopping the sound. And how often do you get to see a saxophone concerto? SD: I understand you are also writing a piece called Louisville Concerto for the October program. TA: That’s a collaborative piece. Its not so much a piece I’m writing as it is a piece I am coordinating. I’m very excited about it because we now have our solo group set. We are taking artists from Louisville, without regard to their genre, and giving these great musicians the opportunity to form a solo quartet. It’s almost as though it was a group concerto like Vivaldi’s Concerto for Four Instruments. SD: Who are the selected soloists? TA: It will be Will Oldham, who is very well known for his lo-fi style and insightful lyrics; Jalin Roze, hip-hop artist; Scott Moore, rock violinist; and Dani Markham, drummer for the Tune-Yards, a very successful local band. Dani is a Louisville native and a student of the Louisville Leopard Percussionists. SD: How will you “coordinate”? TA: Each of these four musicians will work with me to come up with a suite of solo pieces, and then I will orchestrate them and bind the whole thing together. It’s a real group piece. Obviously, I will have my hand in a lot of the musical work behind it; but it is a collaborative effort. SD: You are bringing four musicians who may be unfamiliar to much of your core audience. Why make that move? TA: I want to show that the Louisville Orchestra is really a connecting organization when it comes to music in town. The Orchestra is not just an entity unto itself— we are part of the musical fabric of this community. The point is to bring together all these different musicians and to give the sense that Louisville Orchestra is really a musical home for everybody. The Orchestra musicians also enjoy it because they get to work with all these really fantastic people who are living in the same city. SD: This is an old idea that has simply been forgotten by so many of us in the “classical” world. Improvisation and exploration of unique instrumentation and modalities from all kinds of traditions has been going on for hundreds of years. TA: That’s absolutely right! When you think about some of the innovations and wild things that Mozart, Beethoven and Bach made in terms of experimentation with form and style, they were not the styles they grew up playing. If they were alive, they would probably be encouraging exactly what we are talking about! Even if our music doesn’t sound the same in terms of its style, the spirit is the same. SD: This idea is also mirrored in what Mason Bates has done for the Festival of American Music II concert scheduled for next April. His piece, Mothership, was composed for four specific collaborators. How will you present it here? TA: Solo instrumentation for Mothership changes each time the piece is performed. That is one of the cool things about it. We did it at the Britt Festival using some wonderful musicians from the area as well as musicians from the orchestra. I might even play one myself. We will definitely give the Orchestra musicians an opportunity to branch out a little bit and improvise. There are more opportunities for that next year during the Festival of American Music. I’m trying to open up the Orchestra’s range of techniques and give them opportunities to try creative musical work that you won’t find in other orchestras. That’s a place where we can really distinguish ourselves. We want to position ourselves as part of a shared adventure in a way you won’t find anywhere but Louisville—to make it more attractive for people to travel here to be a part of what we’re about. SD: You are bringing in another Louisville favorite—one who first performed here with his band, The Flecktones, as part of The Kentucky Center’s Lonesome Pine Special. Béla Fleck is scheduled to perform his work The Imposter on the April concert. TA: He and I have worked together in the past, and I respect and admire him tremendously. He is doing for his instrument the kinds of things I hope orchestras can do for theirs: innovation, growth, creativity, openness and a real willingness to connect with people. Béla wanted to do a concerto for banjo and orchestra and he wrote the whole thing himself. He didn’t hire an orchestrator. He wrote the solo part, then studied Bartók, Shostakovitch and others before he began orchestrating it. I have so much respect for his ability to blend and seamlessly transition between styles. SD: On the Festival of American Music II concert in April, you will have pianist/composer Chase Morrin perform his Piano Concerto. What an amazing person! He is working on a dual major in computer science and neurobiology at Harvard while getting a master’s degree in jazz studies at the New England Conservatory of Music. TA: That’s right. He is one of the smartest, most interesting musicians I have ever encountered. It will be, I hope, his break into the orchestral world. I don’t think that is anything he was focused on or even considering. One of the really great things about Louisville right now is its openness to seeing where creative projects can go. Chase is a jazz pianist with extraordinary chops and incredible technique who is also extraordinarily intelligent and curious. It’s very humbling to talk with him and listen to him perform. I wanted to give him his first shot at writing a piece for orchestra and see where that goes. With a commission, you never know what it’s going to sound like, and that is one of the great things about doing it. He is undiscovered at this point, and we’re going to hear his work for the first time. Louisville is famous for that! SD: You’ve also commissioned a new work by students of the Curtis Institute of Music. TA: Curtis is, of course, my alma mater and a school I love very much. I not only believe in the students, who end up going on to have tremendous impact on the musical landscape, but I also feel strongly that performing institutions around the world should be connected to the great learning institutions. I want to be the representative of the orchestra in such a way that we can be the conduit toward the eventual professional life that everybody’s going to have. As students are growing and learning, there needs to be an unbroken stream of creative work as they transition into their roles as professionals. There’s often a period of confusion after graduation, and I hope to help alleviate that by breaking down some barriers. It’s healthy exposure for the Curtis students, and it’s also good for us. SD: Louisvillians have, of course, long been acquainted with one of Curtis Institute’s most renowned graduates, Lee Luvisi. When I think of Lee, I naturally think of Bach, and I see that you are doing a concert entitled “The Bach Effect” in November. Bach is the epitome of all the concepts we have discussed—innovative, creative, curious, open and conscious of the educational needs of future generations. TA: That program is almost a cliché, as it is so heavily Germanic and dramatic. For a lot of people, it’s unclear what it means to be a composer in the baroque and classical periods. We tend to highlight just a few composers and forget that there were thousands of other composers, some of whom were truly brilliant. SD: One composer you have selected is Wolfgang Rihm, who was awarded this year’s Grawemeyer Award. You are performing his work Nature Morte (Still Life). TA: It’s one of his more famous pieces. The work for which he actually received the award had a number of logistical challenges, but I wanted to represent him on the program. The Grawemeyer Award is an important part of Louisville’s musical heritage. It is the biggest prize in the world for a recent composition. SD: I understand you will be performing on the harpsichord for this concert. TA: Yes, I will be performing one of C.P.E. Bach’s works with the Orchestra. We have done that before with the music of Lully. I like to play in the form of the classical era, even though we’re not taking an academic perspective. They don’t need a conductor for these works in the same way. SD: I hear you will also be performing as clarinet soloist this season. TA: Yes, I am. That’s a big project—the Copland Clarinet Concerto. I’ve played it with an orchestra before and it’s about time to do it again. If I don’t give myself concerts on the clarinet, it’s hard to justify practicing with all the other things I have to do; so this will force me to practice. Also, no conductor for that! It will fun but a huge challenge—that piece is super difficult. Fortunately, this Orchestra is very capable. SD: Another highlight will be the return of violinist Augustin Hadelich. TA: Augustin is an old friend of mine and probably my single favorite violinist. If I could choose any violinist in the world as a soloist, it would probably be him. The first time I heard him I was still at school and we were watching the finals of the Indianapolis Violin Competition, which is one of the three major violin competitions in the world. Usually by the final round, everybody is so good that it’s anybody’s guess as to who is going to win. This was a rare case in which it was so obvious, despite the talent of the other competitors, that he was just on another plane. That was a decade ago, but at that moment, I knew that I would get him as a soloist some day. Two summers ago I brought him out to the Britt Music & Arts Festival in Oregon and we totally hit it off. I have worked with him several times now and I love having him. I believe he made his U.S. solo debut with the Louisville Orchestra about ten years ago, so this is a great opportunity to have him back. SD: I know there is a special piece in this program dedicated to the Bernstein Mass, but maybe just a quick word here about Opening Night and your thoughts on this logistics challenge. TA: I don’t think Louisville Orchestra or The Kentucky Center have done anything on this scale before. It requires a lot of collaboration between artists and arts organizations. It requires huge growth on the Orchestra’s part. We are doing it because I think it’s one of the best pieces ever written and one of the most fascinating works for its ability to move, stimulate and excite audiences in ways no other piece does. It is so powerful and emotionally vast while, at the same time, being really fun. It’s a mass and a musical that incorporates spirituality and a tremendous emotional journey. It’s a performance that people around the world and throughout this country will take note of. We want people to sit up and say, “Look what they are doing in Louisville! These are only a few highlights from the Classics season, which also features Jorge Mester on the podium for two concerts. Soprano Kelly Nassief joins Mester in October for Richard Strauss’s Four Last Songs, followed by Tchaikovsky’s Symphony No. 4. Pianist William Wolfram will perform Rachmaninoff’s Piano Concerto No. 2 with Mester and the Louisville Orchestra in January on a program that also includes Martinu’s Symphony No. 6. For more information about the 2015–2016 Louisville Orchestra Classics season, Coffee concerts, Family series, WOW! concerts, Music Without Borders series, as well as what’s happening with Bob Bernhardt and the Pops, go to louisvilleorchestra.org. Tickets can be purchased online or by calling 502.584.7777.